Urgent! The daughter of José Luis Cobo has cancer. José Luis has always supported Sailfest and many other causes in Zihuatanejo by donating his time, beautiful voice and music. Now it is our turn to support him. 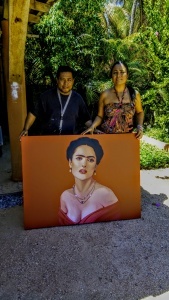 Guadalupe Gaytan Santiago and Alfredo Tapia have generously donated a painting that we will raffle for $20.00 per ticket, 100 tickets. Please click here to donate and I will send you your ticket number. The background is actually red not orange and is valued at 2500 pesos. We will ship it to you wherever you may be. Thanks to our Community for their hard work and support - Por los Niños is blossoming! Soccer uniforms for the children! Today was the chili cook off! Another fantasic Sailfest day - Rally Round the Rock! So this is what it is all about! Today we changed 3 more University students lives forever! Thank you so much Snappy Logos! The Rice and Beans program brings joy! What a delight to be in Zihua! Sailfest 2018 - What a blast! Great organization to get involved in! We would love to keep in touch with you!